For our Interview series, we introduce you today to food writer and cookbook author Domenica Marchetti, who specializes in Italian home cooking. A native New Yorker, Domenica spent her childhood summers in Abruzzo, where her mother is from. Socializing around food was the norm and Domenica soon developed a love for Italian food and cooking, learning from her mother, a terrific cook herself, and the three aunts who had remained in Italy. By the time she was a teenager, Domenica spent a good deal of time cooking and baking, and that passion continued into adulthood. A former newspaper reporter, Domenica switched to freelancing when she needed to have more flexible hours after her two children were born. “I knew I wasn’t going to be a great investigative political reporter because I was more interested in coming home and flipping through my cookbooks and cooking dinner,” she says. So she reinvented herself as a food writer, focusing on home cooking of all Italian regions. She has now written seven books on Italian cooking, including "Preserving Italy: Canning, Curing, Infusing, and Bottling Italian Flavors and Traditions" (2016), "The Glorious Pasta of Italy" (2011) and "The Glorious Soups and Stews of Italy" (2006), and her articles have appeared in national publications such as Cooking Light, Food and Wine, Health, the Chicago Tribune and The Washington Post. Domenica, can you talk a little about your Italian origins and how growing up in an Italian family has influenced your approach to food and cooking? My Italian origins are everything to me. I was born in New York and grew up in New Jersey, and I’ve been living in the Washington DC area for almost 23 years. My mom, mia mamma Gabriella, was born and raised in Chieti (Abruzzo). She came over to the U.S. as a young woman, after World War II. She met my Dad, an Italian American who was born in Rhode Island, in New York on a blind date; they fell in love and stayed here. My mother’s family was all in Italy. She has three sisters who left Abruzzo in the 1960s and shared an apartment in Rome. So from the time I was a baby, we’d go to Italy for the summer, and I’d spend a little bit of time in Rome and then mostly al mare, at their summer house in Silvi Marina, Abruzzo. I had very good Italian friends that I’d see every summer growing up, and there was a lot that we did around food. I got my love of cooking from my mother, I learned how to make pasta from her. A lot of the recipes that have appeared in my cookbooks are recipes that came from her or my aunts. But I also draw a lot of inspiration from the type of cooking that is happening in Italy now. I always say that Italy is such a small country, but every region is vast, and every region has so much in the way of culinary artistry and inspiration. I’m always finding recipes I’ve never heard of before. When I was researching “The Glorious Pasta of Italy”, I took a research trip and ended up in a little corner of Abruzzo that I hadn’t visited before. One night, in a little agriturismo up in the mountains, I learned about maccheroni alla mugnaia, a dish that dates back to the 13th or 14th century. 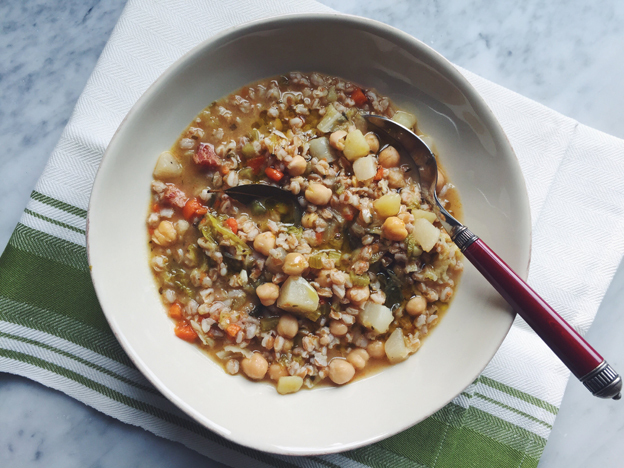 The cook generously shared the recipe with me and that became one of the stars in my cookbook. I had been going to Abruzzo all of my life, but I had never heard of this pasta because it was in a corner of Teramo that I wasn’t familiar with. There are stories like that all over Italy, and they’re still happening. Was it difficult to make the transition into food writing, or did you feel that your reporter skills helped? I really feel that they helped because I use my reporting skills all the time when I write and research my cookbooks, when I interview chefs, home cooks and food artisans. You have to have a keen sense of observation and curiosity, you have to know what questions to ask, you have to know when to be quiet and let your subject do the talking. I think my background as a reporter was tailor fit for me to do what I do. I really like deeply reported cookbooks, I’m interested in where the recipes come from, and knowing more about the regions, the ingredients, the cooking techniques, and I try to include all of that in the cookbooks and articles I write. Explain what goes in the process of writing a cookbook, for you. I try to look at Italian food in a different way because there have been some many Italian cookbooks written, so I try to approach it from a single subject, be it ingredient or dish or cooking technique, and from a different angle that maybe hasn’t been looked at before. My first book, “The Glorious Soups and Stews of Italy,” was published 12 years ago and it’s still in print, which is pretty remarkable for a cookbook, only the classics stay in print for a long time. The idea for my most recent cookbook, “Preserving Italy,” came as I was trying to recreate my nonna’s ‘amarene sottospirito,’ which I remember from childhood. They were so good, but she never wrote down the recipe. And I thought, there are so many different ways that Italians preserve food, but a lot of these are family recipes, and haven’t been written down. The book has a double meaning, it’s not just about preserving food, but it’s also about preserving these ways of preserving food, these traditions. One of the things I really stress and love to do is work with and promote food artisans and winemakers in Italy. I like to promote people who are passionate about what they do. I know so many food artisans in Italy who are not making a lot of money, but they do what they do because they were born into it and it’s the way they express their love for the region and its products. When I did "Preserving Italy," I was able to include six essays focusing on food artisans and that was my favorite part, being able to write about these people and the important work that they’re doing to keep traditions alive, and to share those traditions with new generations of cooks, eaters and travelers. Once a year, you organize an Abruzzo culinary tour in collaboration with Abruzzo Presto. How is it structured? It’s really special, I love bringing people to Abruzzo, to the part of Italy that I spent my childhood and youth in, and that I feel I know better than many places in the U.S.! The kind of tourism I do is very small, six to 10 people max. Abruzzo is not like going on a tour of Rome or Florence, where you walk around everywhere, in Abruzzo you have to drive places, which sometimes are still difficult to access, so we use a small van and every day we have a different day. For example, we have a day when we go to the Gran Sasso mountain; we start in the Navelli plain, we visit a producer of saffron, learn how saffron is made and talk to a woman who has been doing it for decades. Then we head to Campo Imperatore, where we have a wonderful afternoon making and eating arrosticini, lamb skewers, at a very rural, rustic place. 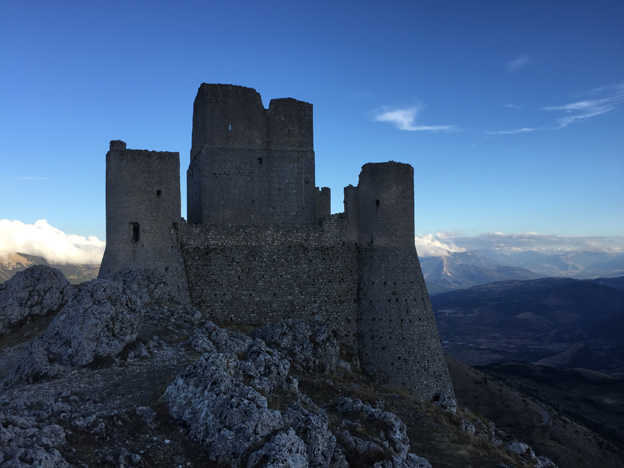 Then we drive to beautiful Rocca Calascio, the highest fortress in Europe. Other days we go to different villages, we go to one of Abruzzo’s oldest wineries, and to one of the newest, we do a little bit of coast, we do hands-on cooking classes, and a market to table class. Cooking and eating with locals is one of the things people appreciate most. We try to structure the tours so that our guests have a flavor for the region. For the first time this year, I’m doing a culinary tour in Liguria (May 21-28). Liguria is so different from all other regions in Italy, and the cuisine also is different. I’m just completely smitten with the food of Liguria! The herbs and the delicate flavors, the fresh cheeses and the seafood, the use of walnuts and pine nuts, I feel like there’s nothing quite like it, it’s really special and certainly very different from what most Americans think of as Italian cuisine. Speaking of which, when most Americans talk about Italian food, are they really talking about Italian American food? Do you think they’re a little more informed now or that there’s still a lot of misinformation? Yes and yes. They’re more informed and there’s still a lot of misinformation. Italian American cuisine has a stronghold, and it’s a completely different cuisine from Italian cuisine, and when it’s done well, it can be good. But I really do think of them as two separate cuisines. My mom was always very dismissive of it, because she was born and raised in Italy; she did not like anything that was associated with Italian American cooking, so she kind of turned me into an Italian food snob that way! But I’ve changed my views because I do feel it is a legitimate cuisine in this country and there are iconic dishes that have come out of it, like chicken parm, pollo alla parmigiana, the toasted ravioli of St. Louis, even buffalo chicken wings, who were started by an Italian American in Buffalo. There has been a change in Italian American cuisine, now there’s a lot of focus on different regional pastas in Italian restaurants in the U.S. I grew up with my mother making spaghetti alla chitarra (the Abruzzese use the chitarra), and I’ve been making it for years myself, but, until recently, you’d never heard of maccheroni alla chitarra outside even of Abruzzo. Now in Washington DC, all of the Italian restaurants have what they call 'chitarra noodles.' So there is this meshing of regional authentic Italian and the chef’s take on Italian cuisine, it’s a hybrid cuisine. Even in my pasta book, I have something called BLT bucatini, made with pancetta, roasted cherry tomatoes and arugula, it’s not authentic Italian, but it springs from tradition and it comes from my kitchen. This is something I think about often, how much do you want to adhere to tradition, how much do you want to express your spirit and inspiration, and am I diluting or doing damage to Italian cuisine when I do recipes like that? It looks like there’s a bit of food hysteria these days in the sense that there’s a lot of confusion about what we should eat and not eat, and perhaps the increasing, and very reasonable, attention to what we eat sometimes goes too far, so now we have the gluten free, the fat free, the sugar free, the carbs-free, etc. Italians still seems to have one of the healthiest and wisest relationships with food. What’s your take on all this? I hope that doesn’t change. I do come to Italy and see more menus that say gluten free, and I’m not saying that attention shouldn’t be paid to it, but I do think there’s hysteria. In the U.S., we’ve always had this mania for dieting and we have a tendency to take things too far. I personally tend to not focus on them too much in my writing because I see there are many other people who do, so I would much rather focus on the things that I know about. My interest is in translating real Italian food for Americans. It’s common sense eating. Of the seven cookbooks you wrote, do you have a favorite? I have to say I love them all! It’s like having a baby, you work on one for a year and then it’s another year before it comes out. “The Glorious Pasta of Italy” has been my most successful book. 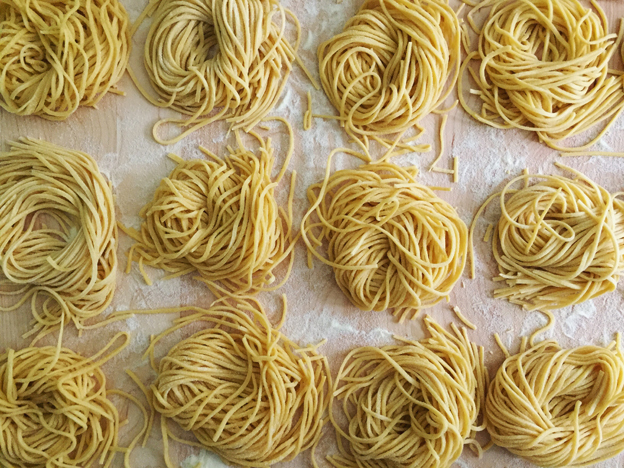 If chefs know my work at all, it’s because of that book, a deep dive into making pasta. 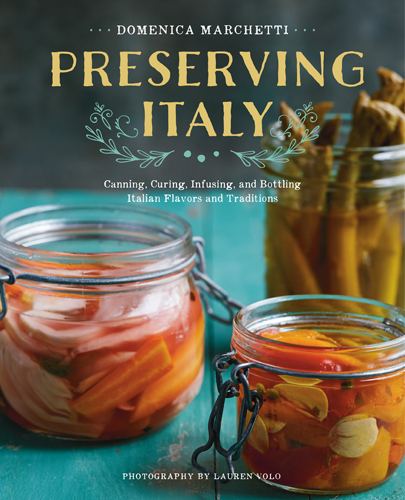 I also love “Preserving Italy” because these traditions of preserving food are so important. Maybe we do it less out of necessity now, but it’s such a rewarding pursuit to make a big pot of jam or to do melanzane sott’olio and to see the transformation of a raw eggplant into almost a different food by the time it’s done. You have to salt it, dry it, pickle it, dry it again, then immerse it in oil and let it sit, and what you end up with is a completely different vegetable from what you started with. Watching that transformation is fascinating. I learned so much working on that book. Thank you, Domenica, for your time. To learn more about Domenica Marchetti and to buy her cookbooks, visit her website Domenica Cooks.